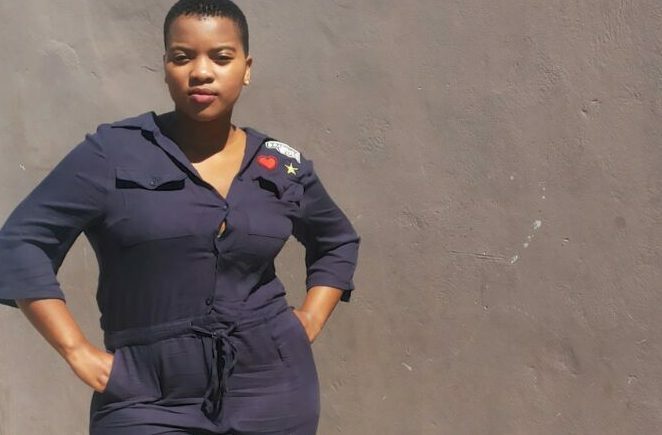 From a reluctant IT learner to an innovative young developer, by way of Code for Cape Town and CodeSpace Academy, Mandisa Dlubom has a success story to prove that lots of perseverance plus a little inspiration will always pay off. Let’s start at the beginning. Why did you decide to learn to code? I’ll be honest: I didn’t decide to start coding. There was no initial interest, nor did I even know what coding was. I went to high school at COSAT, and there are only four main subjects, namely Life Sciences, Physical Science, Maths, and IT. It was through IT that I was introduced to coding. Even so, I was doing IT because it was compulsory – and I hated it. One of the reasons for that hate was my belief that it wasn’t for girls. Now I realise how sad that is: that girls have this limiting belief that has been enforced and still is. In 2014, I went to a Code for Cape Town two-week camp, and even then I didn’t believe that I would be able to grasp whatever we were going to learn – I just wanted to go to a camp. Long story short, my mindset changed. Not having boys around sort of made me put in the effort and learn web development. To my surprise, I managed to produce a blog. Since then, subconsciously, I started putting more effort into my IT studies. Some learnings that I took from that experience was that I shouldn’t sell myself short, that I can never achieve much if I don’t put in the effort, and that girls, too, are able to code. Later, I was introduced to CodeSpace Academy through Code4CT, and now I’m working as a Web Developer. My plan is simple: I go through tasks that I wanted to finish the day before and make a plan for the day ahead. Plans can always change, but having the end goal of my day in mind helps me manage my time and work. I take breaks, even if it’s just standing in the sun for a minute, and get back to work. I have great coworkers that I’m always happy to be around. I have a mentor – Kapeesh Minalil – and the culture at my workplace is great that I’m excited to go to work every day. I wanted to be a teacher. I still believe that teachers have an influence on students and may have a great impact on someone’s mindset. I’m happy as a developer. I love the challenge of always developing my skills, and I feel like just as a teacher would, I can make a great impact on people – through technology. Could you tell us a little about your career so far? I’m still very new in my career journey, literally I learn each day and that’s sometimes uncomfortable. I’ve learned that with coding, I’ll always feel a bit uncomfortable, but I’ve grown to love the feeling – I never wish to ever be comfortable with my job. To me, being comfortable would mean that I’m not challenged anymore and that the passion is kind of fading. What’s one of your proudest achievements? Why is it important that women get more involved in the world of tech? I believe that with more woman in the industry there would more amazing tech solutions. Diversity is always key – and helps create great products – so to me more women would be a game-changer for coding. What, in your opinion, are the biggest barriers that have held women back from careers in coding? I feel like it is the limiting belief in our societies that woman are not meant to be in the tech world – not being exposed to an environment that believes the woman can be in the tech world is one of the factors. I feel like there should be more organisations like Code4CT, GirlHype and Future Females that empower women and enforce a growth mindset that woman are worthy of tech jobs. What would be your advice to girls and women wanting to begin their tech education? I would advise them to start now: now is the best time to start. Do your research and get on with it. If you could change or improve one thing about the tech industry, what would it be? I’m still very new in my industry so I don’t really have an answer. I believe one can form an opinion only once they’ve had proper research or experience. From the little experience that I’ve had, I’d like for companies to treat interns with the level of respect they deserve and to remember that an internship is to equip the intern with the skill sets they’ll need to know the job thoroughly. Currently, I’m at Responsive Digital Innovation, having got this job through CodeSpace, and I feel that I’m invested in and treated as an asset. Read more about Mandisa’s career on the Responsive Digital Innovation blog, or see her #WhyICode story collected with many more from Code for Cape Town.